Make a difference in the lower San Lorenzo River ecosystem by volunteering with a Coastal Watershed Council’s River Health Day. 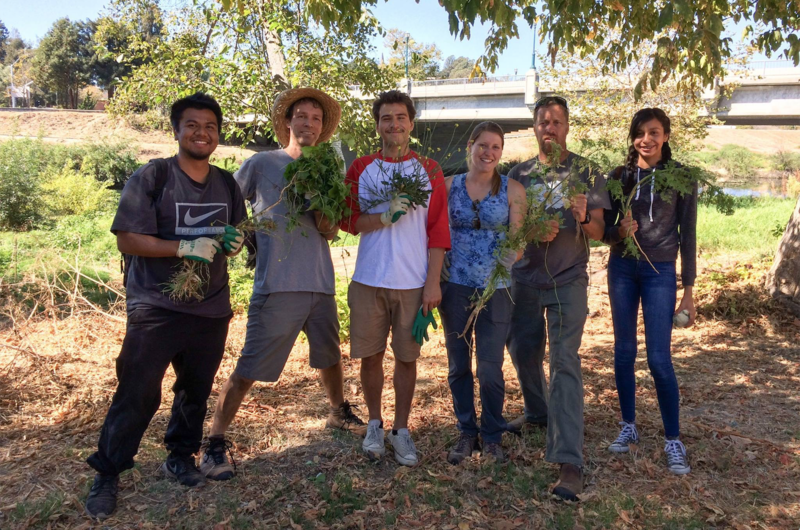 During the December River Health Day, we will be planting native plants along the banks of the San Lorenzo River to improve biodiversity and habitat complexity in the river ecosystem. This event will take place on the east bank of the San Lorenzo River upstream of the Broadway Avenue Bridge. We will meet at the Santa Cruz Riverwalk adjacent to Mimi De Marta Dog Park on 119 Broadway Santa Cruz. We highly recommend walking or biking to the event as there is limited parking in the area. Gloves and tools provided. Wear sturdy shoes and layers. We recommend that all volunteers dress in comfortable gardening clothes, include long pants, socks and sturdy shoes. Bring sun protection and a reusable water bottle. Volunteers under the age of 18 must be accompanied by an adult. Call (831) 464 9200 with any questions before the event. Location: We will be on the riverwalk in Downtown Santa Cruz. This River Health Day is about a 2.5 hour event that starts at 9:30 am and goes until 12:00 pm, but we encourage people to commit to however long they desire! Whether you would like to stay for half an hour, an hour, or even a little more than two hours, we are happy to see you out there!